So, although it may not come up often on here, I love to bake. When I was in high school, the week before Winter Break consisted of me asking each friend whatever type of cookies they would like this year, then baking all of them and bringing them to school to pass out. Once, I baked for seven straight hours in order to make 9 varieties of cookies (including at least two types that I never tried so I can only assume my friends didn't lie to me when they said they liked them!). When we lived in Pennsylvania, I first tried my hand at doing layered cakes, and was surprised at how simple it can be. I learned to drizzle chocolate over the top and down the sides. 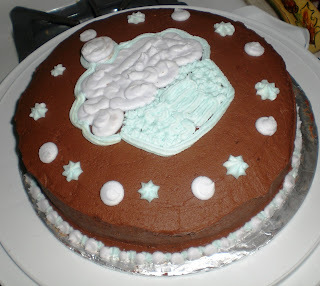 But, that's really the extent of my know-how in decorating cakes. In fact, for a long time I tended to make brownies instead, since you don't have to frost those. It just really bothers me to see the top of the cake have an uneven surface, so I preferred not to ice the cake at all. Now, since about 2006, I've wanted to take a cake decorating class. But, it had never been convenient, especially trying to have a single night free consistently for a month. But, last month, I decided that I needed to make it happen. By the time I decided to look up when and where I could learn this out here, I was surprised to find out that there were two beginner's classes starting that week! As soon as I was sure that I could commit to four Thursdays in a row, I rushed down and signed up, nabbing the final spot in the local Wilton's class. I had a bit of difficulty finding all of the supplies (you'd think they could put stickers or something in the "cake aisle" when a class is about to start... just to make it all a tad easier. For the first lesson, I needed to bring some basic supplies, a few other household items (like an apron), and six plain, flat cookies. So, I baked the largest sugar cookies I could (they should really specify what diameter they want), and brought in seven (you know, since I tend to mess up things, I thought I'd need an extra, LoL). Turns out, almost everyone had just bought a pack of sugar cookies at Safeway.... it never even occurred to me that I could have just done that. But, regardless, my cookies were roughly the same size (though not as thick), so nothing lost there. And mine were totally cheaper. 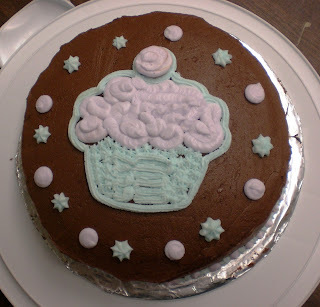 The first class focused on some basics (properly baking, leveling, torting, filling a cake), but we also learned how to make buttercream icing (and how to properly color it), how to fill a bag, and how to pipe stars. The instructor didn't come around and comment on every single person's practice board, but they looked good enough to me. 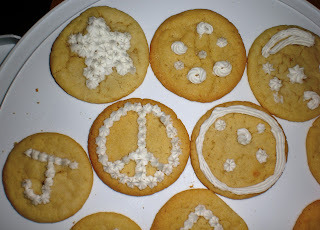 I also only had time to decorate four of my cookies, since I had a bit of a late start - we had all brought "stiff" frosting to the first class, and needed to turn it into "medium" consistency, and I was the last person to get the water to mix in. But, Jonathan promptly ate one when I got home, so it all worked out well. Now, I'm taking this class ultra-seriously (and, if you know me, you expected that, haha). I'm going over my notes, I'm reading and re-reading the book, and I'm practicing everything like we're supposed to between lessons. So, this meant that I decorated another eight or ten cookies, working through the stars and even figuring out how to do swirls. I had to make my frostings by hand (no hand or stand mixer), which is a pain. It takes about half an hour per batch (2.5 cups), since I take a couple breaks in order to keep stirring. I also learned very quickly that I don't like the Wilton buttercream recipe at all. It's waaaay too sweet for me... it tastes like the filling of an Oreo... and I don't want that on a cake! So, I made my second batch for the second week chocolate, since we were also given that recipe. I thought it was much better, and it probably would've been excellent if I had butter flavoring to use (I had to use vanilla). I brought this up in the second class, but nobody else thought the icing was too sweet, although one other girl asked about how to make a cream-cheese-base instead (which I'm looking forward to trying myself!). We also had to bring in an 8" cake for the second class, where we leveled, torted, filled (I made mocha-toffee pudding for filling), and iced (complete with learning to transfer a pattern!) in class. you can see large and small stars, circles and elongated circles, and lines. You can also see my pretty-smooth top, the chocolate color, and the light purple and green that I mixed. After frosting, my edges weren't perfectly even anymore, but you can see my border from this angle - it's just alternating dots and stars. We learn "shells" soon and I'm looking forward to that. Everything moves so fast in class, and the instructor is very... "engineer" (Jonathan used that word to describe her after I told him about her). She doesn't give any praise at all, or affirm that you're doing anything correctly. Only criticisms, and many of them are along the lines of "now, what did I say about doing that?" and "don't you remember I said to use a 45-degree angle?" It bothers me. So much so that I'm pretty sure I'm going to take my subsequent courses at a different store (I already determined that she teaches at two, so I'll just take classes at another one... luckily Michael's is prevalent in this area!). Anyway, I hope you enjoyed this - a little something different. I'll do another post after I've finished the other two classes in this course. This is so interesting, thanks for sharing. I like the design you chose for your cake, it looks great!